A range of conditions affects the ability to move or control movement. They may have their origin in either the central nervous system or in more removed locations closer to where nerves end and muscles begin. Some of the disorders include amyotrophic lateral sclerosis (ALS), multiple sclerosis, Parkinson’s disease, various dyskinesias, dystonia or the restless leg syndrome. Despite the essential similarity of these conditions, they can manifest in various different ways. Therefore, it is thought that they all have very different etiologies and pathologies. However, a new study suggests that there may be a unifying factor that has been overlooked until now. The research in question was conducted at the Salk Institute of La Jolla, California. The study may have uncovered a previously unknown role for a widespread blood protein. It appears that this protein has a detrimental effect on nerve endings that interface (or form synapses) with muscle tissue, and thus, facilitate movement under conscious control. The health and volume of these synapses, known as neuromuscular junctions (NMJs), can define an individual’s functional status, and often suffer damage or degradation in conditions such as ALS. A New Role for a Familiar Old Enzyme? The protein was found to be thrombin, an enzyme that has a role in blood clotting and normal liver function. However, this coagulation protein is also ubiquitous in the blood, which gave the Salk scientist, Kuo-Fen Lee, the idea that it may have other functions in different tissues. Lee, a professor and the holder of the Helen McLoraine Chair in Molecular Neurobiology at the institute, and his team may have found a connection while conducting a routine evaluation of NMJs. 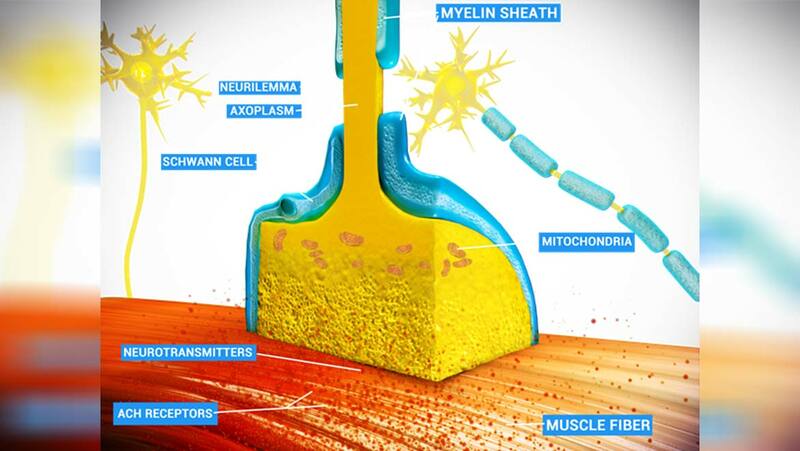 When neuromuscular junctions were originally discovered and characterized by scientists, it was thought that its only mandatory components were the nerve endings – also known as axons – that transmitted the impulse to move, in addition to the muscle cells on the receiving end of this signal. However, subsequent research uncovered the concept of modulation at the NMJ. This is necessary as the neurotransmitter, acetylcholine, which is released by the axon’s synaptic terminal and travels across this interface in order to activate the muscle cell in question, was found to be detrimental to the NMJ in excessive concentrations. Therefore, acetylcholine levels require regulation, of some kind, or control at a given junction. More recent studies have indicated that a specific kind of neurological cell may be strongly associated with this role. Known as Schwann cells, they provide the lipid-rich ‘insulation’ often seen around fast-acting nerve cells. This insulation, known as myelin, wraps around a long, thin nerve cell’s body, not unlike the plastic that coats electrical wiring. It has a relatable function too -- making sure that the electrical impulses that run along a nerve body move fast enough and are not ‘dropped’ along the way to a synapse such as one found at an NMJ. Now, it appears that Schwann cells are also present at the NMJ, where they are known as terminal or peri-synaptic Schwann cells (TSCs). These cells are currently acknowledged as a third, essential moiety of the typical NMJ. Professor Lee and his team had been engaged in a project to assess the NMJ in order to identify new factors that could disrupt or impact on it. They were surprised to realize that acetylcholine levels that were allowed to become dysregulated, induced thrombin, as well as other enzymes, to leave a muscle cell and start to attack the NMJ. Copious amounts of this activity were shown to be capable of considerably degrading a junction over time. The scientists validated these cell-level findings by translating them to a mouse model of Schwann cell deficiency. Again, they found that thrombin was responsible for the junction’s degenerations in these mice. However, the presence of Schwann cells was found to address this effect. The Lee group also reported that a second mouse model with a thrombin knock-down exhibited reduced synapse degradation. Therefore, it now appears that the enzyme may be associated with the potentially negative effects of acetylcholine at the NMJ. This research, which will feature in a March 2019 edition of the journal, PLOS Genetics, also appears to validate earlier work pointing to the indispensable role of TSCs at neuromuscular junctions. This new model of movement disorders may also warrant a re-visit of the research currently conducted on conditions such as ALS. Should thrombin be seen to play a role in this disorder, or others in the same vein, it may lead to a significant overhaul in their understanding. This, in turn, could lead to the improved treatment of many types of motor impairment in the future.